ABOVE: This November, 2007 photo shows the bridge's prefabricated sections in place, with final construction proceeding bit by bit. The bridge finally opened ten months later. 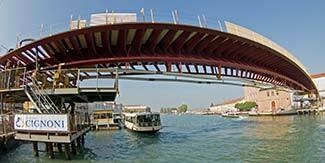 After years of construction delays and cost overruns, Venice has a fourth bridge across the Grand Canal. The bridge is officially named the Ponte della Costituzione, but nearly everyone in Venice calls it the Ponte di Calatrava. The bridge was designed by the Spanish architect Santiago Calatrava, whose past projects have included the City of Arts and Sciences in Valencia, Spain, the Olympic Sports Complex in Athens, and the precedent-setting "twisting torso" skyscraper in Malmö, Sweden. In January, 2007, construction crews began driving piles for the new bridge in the Canale Grande between the Piazzale Roma and the Santa Lucia Railroad Station. The bridge's prefabricated sections were floated to the construction site by barge in August. Some progress had been made on final assembly when the photo above was taken in November, 2007, and the bridge opened to the public on September 11, 2008. The Ponte di Calatrava is a long, sweeping curve of glass and steel that is designed to complement both the historic buildings on the Piazzale Roma side of the canal and the 1950s modernity of Venice's main railway station. Now that it's open, travelers won't have to go out of their way to cross the canal via the Ponte dei Scalzi or pay to ride the vaporetto as they've been forced to do in the past. The bridge has provoked its share of controversies, including concerns about the bridge's accessibility to locals and tourists in wheelchairs. Although the Calatrava Bridge looks high, the steps are low, and it's fairly easy to cross on a dry day (even with heavy luggage).